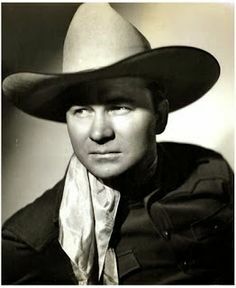 Tex Ritter (January 12, 1905 – January 2, 1974) was an American country music singer and actor popular from the mid-1930s into the 1960s, and the patriarch of the Ritter acting family (son John and grandsons Jason and Tyler). He is a member of the Country Music Hall of Fame. Singing cowboy Tex Ritter stood as one of the biggest names in country music throughout the post-war era, thanks to a diverse career that led him everywhere from the Broadway stage to the political arena. 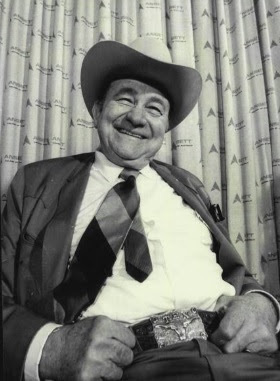 He was born Maurice Woodward Ritter in Marvaul, Texas and grew up on a ranch in Beaumont. After graduating at the top of his high school class, he majored in law at the University of Texas. During college, however, he was bitten by the acting bug and moved to New York in 1928 to join a theatrical troupe. After a few years of struggle, he briefly returned to school, only to leave again to pursue stardom. Ritter was playing cowboy songs on the radio when he returned to New York in 1931 to act in the Broadway production Green Grow the Lilacs; during scene changes, he also performed on his guitar. 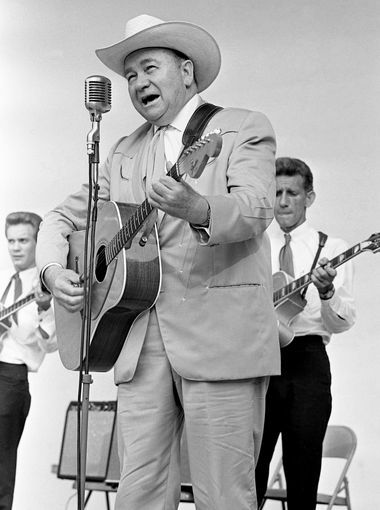 Thanks to his success on the stage, he began hosting radio programs like Tex Ritter's Campfire and Cowboy Tom's Roundup before entering the studio with producer Art Satherley in 1933, where his deep, lived-in voice graced songs like "Rye Whiskey." 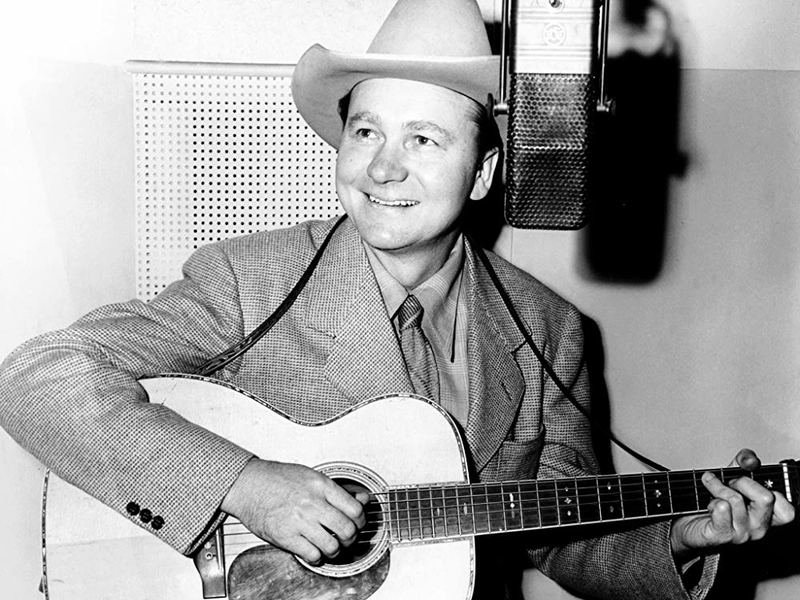 recorded 29 songs for Decca, the last in 1939 in Los Angeles as part of Tex Ritter and His Texans. 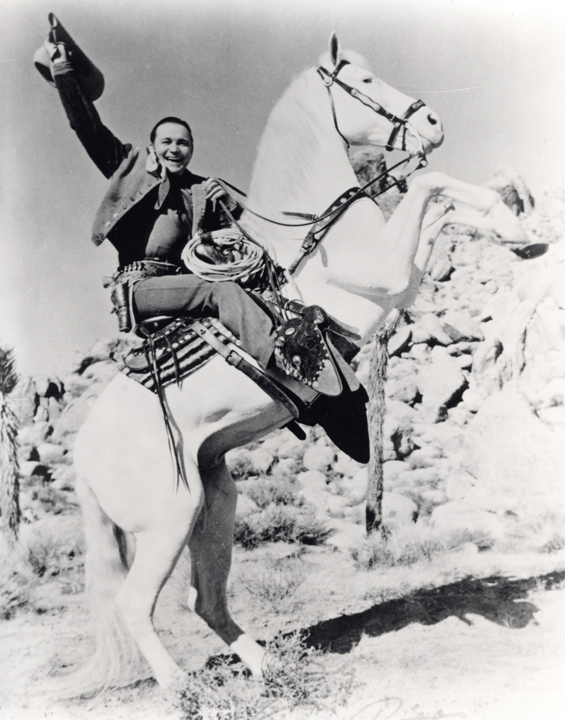 He caught the attention of Hollywood producer Edward Finney, who was searching for a cowboy singer in the mold of the highly successful Gene Autry and was tapped to star in the 1936 Western Song of the Gringo. Over the next two years, Ritter starred in a dozen films, including 1937's Trouble in Texas (co-starring a young Rita Hayworth), before Finney's studio, Grand National Pictures, folded. Ritter then switched to Monogram Studios, for whom he made some 20 Westerns, including 1940's Take Me Back to Oklahoma with co-star Bob Wills; work at Columbia and Universal followed, and by the time of his movie swan song, 1945's The Texas Rangers, he had appeared in a total of 85 films. As Ritter's Hollywood career went into decline, his music career began to blossom, and in 1942, he became the first country artist signed to Capitol Records, where he recorded everything from traditional folk tunes to patriotic material to sentimental songs. In 1944, Tex Ritter & His Texans topped the charts with the single "I'm Wastin' My Tears on You." The record's flip side, "There's a New Moon Over My Shoulder," peaked at number two, as did the follow-up "Jealous Heart." 1945's "You Two-Timed Me One Time Too Often" proved to be Ritter's greatest success, holding at number one for 11 consecutive weeks. Among his other successes in the 1940s were 1945's number one "You Will Have to Pay," 1948's "Rock and Rye," and 1950's "Daddy's Last Letter (Private First Class John H. McCormick)," based on the actual correspondence of a soldier slain during the Korean War. Ritter first toured Europe in 1952, where his appearances included a starring role in the Texas Western Spectacle at London's Harringay Arena. That same year, Ritter recorded the movie title track "High Noon (Do Not Forsake Me Oh My Darlin')", which became a hit. At the first televised Academy Awards ceremony in 1953, he sang "High Noon", which received an Oscar for Best Song that year. The resulting single proved extremely successful with pop audiences, helping win him the job as the MC of the television program Town Hall Party, which he hosted between 1953 and 1960. In 1958, he issued his first full-length LP, Songs From the Western Screen, followed the next year by Psalms. After leaving Town Hall Party, he released the LP Blood on the Saddle, a dark collection of cowboy narrative songs, and in 1961, he returned to the country charts after an 11-year absence with the Top Five hit "I Dreamed of a Hillbilly Heaven." In 1963 Ritter began a two-year tenure as the president of the Country Music Association, and in 1965 he moved to Nashville to join the Grand Ole Opry. After an unsuccessful bid for the U.S. Senate in 1970, Ritter died of a heart attack on January 2, 1974; his son John Ritter carried on the family name as a popular actor in TV sitcoms like Three's Company and Hooperman. Of all Hollywood's 'singing cowboys', Tex Ritter, with his tack-plain but sincere bass, sounded most like the genuine article. This 28-track overview of his Capitol recordings spans 1942 to 1957 and a variety of production approaches from the folk spareness of Rye Whiskey in 1946 to the Baroque Western ripeness of Gunsmoke in 1955. On many of his Capitol sides, Tex was supported by such ace Capitol country accompanists as steel guitarist Speedy West and guitar legend Merle Travis. 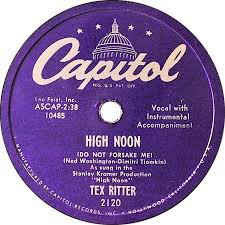 The set opens with High Noon recorded and released in England, and ends with Capitol's 'country' version. A true Bear Family classic! A big thank you to Ludovico @ Entre Musica for original post. 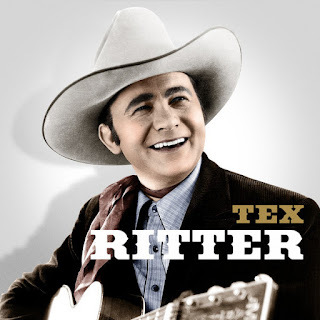 Thank you for this... it is not easy to find a good collection of Tex Ritter. I only know a handful of these tracks, can't wait to hear the others. Apparently it's from a 4cd box set by bear family records. I could only find CD1 from quoted source, but will keep an eye out for the rest. 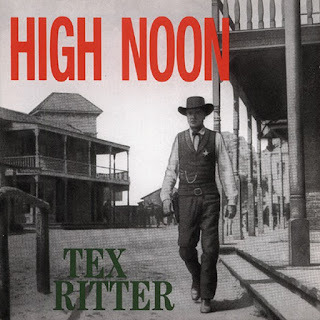 Bear Family had three different collections by Tex Ritter issued under the title High Noon. First there was a 17-track LP (BFX-15126) released in 1984. Then there was this 28-track single CD (BCD-15634)released in 1992, focusing on cowboy and movie songs. Finally, there was a 4-CD chronological (1947-1954) boxset (BCD-16356) released in 2000. The first disc in the boxset has only 26 tracks, many of which are not found on the 1992 single disc. The 1992 single CD includes some cowboy songs from the other Tex Ritter 4-CD boxset Blood on the Saddle (BCD-16260) covering the period 1932-1947, released by Bear Family in 1999. Just a quick note to let you know that I still drop by and pick up some great information. Thanks so much for the posts.